Excellent spot for Summer Tanagers. left of the 'B' on the map below. gravel shoulder on the 220 southbound side of the road. Currently the wetlands are off-limits to birders, so stay on the shoulder of the road and do not go beyond the gates on the roads leading into the marsh. Due to the limited access, a spotting scope will be indispensable. One of the best spots in the Roanoke Valley for seeing herons and egrets. water birds have been seen here. Look for Wood Ducks flying along the river. A guide to birding some of the hot spots in Roanoke, Botetourt County and surrounding areas. This guide is meant to assist the unfamiliar to a few good birding spots in the area. In the earlier versions I had a lot of help from Mike Smith and I thank him for it. For the first revision I had John and Eunice Hudgins to thank for their assistance in the field. Now, with Jim’s blessing, I have attempted to bring this marvelous document up to date with the help of fellow Roanoke Valley Bird Club members: Mike Donahue, Mike Purdy, Kent Davis, Alyce Quinn and Robin Austin. DIRECTIONS: Take Rt. 11 (Williamson Rd.) north of Roanoke 1.6 miles north of the intersection of Williamson and Peters Creek Roads, turn left on Rt. 648 2.6 miles to the boat landing parking lot. You must go to the boat landing building and pay a fee which the city requires for use of the recreational area. Land use hours are 6 AM to 10 PM (April thru September) and 8 AM to 7 PM (October thru March). GENERAL INFORMATION: The trail system and service roads are available for hiking, biking and horseback riding. The terrain is moderately to steeply sloped. For the enjoyment of all visitors, trail users are asked to be courteous; bikers should yield to hikers; bikers and hikers should yield to horseback riders. All trail users must stay on trails and service roads at all times. This area can be productive in all seasons. In spring and summer for migrants and summer breeders, in fall for migrants and permanent residents, and in winter for permanent residents such as owls, woodpeckers, nuthatches, chickadees, titmice, juncos, etc. Rare and unusual birds found over the years include Red Crossbills, Snow Buntings, White-rumped Sandpipers, White Pelicans, Bald and Golden Eagles, Northern Goshawks, Merlins, Red-necked Grebes, Red-throated Loons, White-winged Scoters, Long-tailed Ducks, Caspian, Forster’s, Common and Black Terns, Laughing, Bonaparte’s and Great Black-backed Gulls, and Little Blue Herons – to name a few. HOW TO BIRD IT: Park near the left end of the lot and go out on the wooden “deck” for good views of the lake. Scan the surface for waterfowl, trees on the shoreline for hawks, and the sky above for hawks and incoming waterfowl. Patience often is rewarded by arrivals and birds passing over the lake. There is a trail from the left end of the lot which follows the shoreline to a good view of the dam in the distance (this trail actually goes all the way to the dam). The best trail is at the other side of the lot – a fire trail that goes through the picnic area and generally follows the shoreline for some six miles to the Bennett Springs end of the cove. Walk, bike or ride your horse as much of this as you like. The trail is “hilly” but is fairly easy walking. DIRECTIONS: Take I-81 north of Roanoke past Buchanan to Arcadia exit #168. Turn right onto Rt. 614 for 1.5 mile to the bridge over the river James. Park on the right on far side of bridge. GENERAL DESCRIPTION: This area has at least seven great spots (directions, etc. to follow). Six mountain streams join one another and flow into the James River at Arcadia. McFalls Creek and Middle Creek merge with Jennings Creek, Cornelius Creek and Apple Orchard Creek join to form North Creek which flows into Jennings Creek which goes into the James River at Arcadia. It is a paradise in spring and early summer. Summer and fall are good, but winter is not recommended. HOW TO BIRD IT: In spring and early summer, park, look and listen. The trees and bushes on both sides of the road usually yield such species as orioles, Warbling Vireos, Indigo Buntings, Field Sparrows, Brown Thrashers, etc. Walk down to the river and check the trees along the bank for Bald Eagles (yep, seen in May 2009), Yellow-throated Warblers, orioles, American Goldfinches, etc. (Do not walk in the pastures – this is private property.) Watch the fields and hedge rows for Chipping Sparrows, Eastern Bluebirds, etc. Check the sky frequently for hawks or migrating Ospreys. Continue .6 miles to the Jennings Creek Bridge. Park on the right just over the bridge and check for Warbling Vireos, swallows, Yellow Warblers, orioles (great spot for Orchard Orioles), etc. Another .6 miles brings you to the now abandoned Arcadia Store (its famous Arcadia Subs but a faded memory; however, a recent attempt at renovations indicate it may reopen). This is another good spot for orioles, Yellow Warblers, etc. 2) SOLITUDE: Just past the store, turn left on Rt. 622 and go 1.5 miles to Solitude Swamp on your right (sorry, no sign). This is a woodland swamp which has yielded Wood Ducks, Prothonotary Warblers, Louisiana and Northern Waterthrushes, Wood Thrushes (and one record of Swainson’s Warbler!). On the left it is productive to scan over the river for swallows and check the wires for Blue Grosbeaks. Continue on this road and you may hear and see Yellow-breasted Chats, Prairie Warblers, Brown Thrashers, etc. The road dead-ends at a gate, so turn around and go back the way you came. 3) JENNINGS CREEK: Turn left on Rt. 614 and drive slowly up Jennings Creek, listening for Louisiana Waterthrushes, Eastern Phoebes, Northern Parula Warblers, etc., stopping along the way to enjoy the beautiful mountain stream and scenery. 4) MCFALLS CREEK: Continue on Rt. 614 about 3.5 miles to Rt. 618. Turn right along McFalls Creek. Rt. 618 goes all the way to the Blue Ridge Parkway at Powell’s Gap. The best birding is along the creek before the road begins to climb upward. Listen for Northern Parula Warblers and Louisiana Waterthrushes. There are foot trails from time to time on the left which are great to explore as well. Much of the area to the right is private property and seriously posted. Just as the road begins to climb up the mountain there is a road to the left which makes a good turn around spot. 5) NORTH CREEK: Backtrack on Rt. 618 to Rt. 614 and then 3.l miles to the National Forest Camp Ground, North Creek road. Turn right and go up North Creek. Or, if you didn’t go to McFalls Creek and are coming from the Arcadia store, turn left at the campground sign (.4 miles from Jennings Creek Bridge). Every foot of this road is great birding. Look and listen for Louisiana Waterthrushes, Northern Parulas, Black-throated Green and Pine Warblers. Good stops along the way include Colon Hollow Shelter (it has an outhouse) and Whitetail Trail on your left and several unnamed trails on your right (including the Travel Trailer Sanitary Station, usually a good spot for Northern Parula Warblers). Continue on North Creek Road for 4.9 miles to a parking area at the end of the road where Apple Orchard and Cornelius Creeks join to create North Creek. North Creek is one of the most beautiful trout streams in Virginia. Great experiences are everywhere with wildflowers, birds, ferns, etc. From the parking area, walk back along the road .5 miles to a gated fire trail to your left. This takes you gradually up above the creek and you can look down into the canopy at the birds (such as Black-throated Green Warblers). You could also encounter Wild Turkeys or Ruffed Grouse. In early May you may be overwhelmed by thick banks of Fringed Polygala (Gaywings). Walk as far as you like up this trail. It eventually peters out after about 2 miles. For some reason, I call this North Creek Trail. Back at the parking area there is a set of footbridges and a fine trail up to Apple Orchard Falls which offers great spring and summer birding. 6) WARBLER ROAD: From the end of North Creek Road, backtrack 2.1 miles to the first road on your right. This is called Pine Mountain Road and leads up to the Blue Ridge Parkway at Sunset Fields Overlook (milepost 79). This is known as Warbler Road because over the years it has been possible on a good day in May to experience some 25 species of warblers from the intersection of North Creek Road and Pine Mountain Road to Sunset Fields Overlook. Drive slowly up this curvy but otherwise excellent dirt road, stopping whenever you hear or see something of interest. In addition to warblers there could be Scarlet Tanagers, Red-eyed and Blue-headed Vireos, Dark-eyed Juncos, Wild Turkeys, Ruffed Grouse, Indigo Buntings, Rose-breasted Grosbeaks, etc. There are also wonderful wildflowers on the banks beside the road and bobcats have been seen crossing the road! At the top of the first ridge (2.75 miles from North Creek Road) you will come to a stop sign with options to go to Cave Mountain Lake or to the Parkway. You want to go right toward the Parkway on Rt. 812. Stop often as the elevation and habitat change. Park in the turnouts and walk the road a bit in both directions. Keep your eyes and ears open and check everything out. Even though Warbler Road is probably only 9 miles long, you will want to allow plenty of time to enjoy everything it has to offer. 7) PARKER’S GAP AND APPLE ORCHARD FALLS TRAIL: At 3.2 miles up Warbler Road you will come to a sign on the left saying, “Parker’s Gap” (frequently obscured by vegetation). Turn right down the road opposite the sign (if you can’t find the sign, this is the only right turn in the neighborhood). There is excellent birding along this road with opportunities in the past for Chestnut-sided Warblers and Rose-breasted Grosbeaks. This area was heavily logged in the late 1980’s and is still transitioning to mature woodlands. At the end of this road (2 miles) there is a turn-around and places to park. There is a trail at the end of the road which takes you 25 to 30 feet or so to a well-blazed trail up to Apple Orchard Falls and Sunset Fields. The 1-2 mile stretch up to the falls is moderately strenuous and requires waterproof footwear or a casual attitude about wet feet. You won’t see or hear too many birds (Northern Parula Warblers singing in the trees over your head and nesting Eastern Phoebes perhaps under the falls) but the falls are very impressive, especially in a wet season. Backtrack to Rt. 812 and continue 3 miles up to the Parkway at Sunset Fields. Along the way you could encounter Cerulean, Hooded, Worm-eating, Kentucky, Black-and-white, Pine, and Blackpoll Warblers, Ovenbirds and many American Redstarts. There is a nice little waterfall on the left along the way and Black-throated Warblers nest in the neighborhood. Chestnut-sided Warblers are fairly predictable at Sunset Fields. Just before you hit the asphalt of the overlook, there is a road sharply off to the left which parallels the Parkway almost to the top of Apple Orchard Mountain. This is Veery country and has been a very reliable area for Canada Warblers. The road ends for you at a gate with a fairly good turn-around opportunity. This is a worthwhile side trip for birds, ferns and wildflowers. Take the Parkway to the right (south) to return to Roanoke. If it’s early June you’ll catch the spectacular rhododendron show that begins about 7 miles from Sunset Fields. DIRECTIONS: From Roanoke take Rt. 460 east to the Blue Ridge Parkway entrance on the right. Go north on the Parkway to milepost 92.2, Harvey’s Knob Overlook on your left. HOW TO BIRD IT: In early to mid September, pack your lawn chair and lunch and tool on up the Parkway for a day of watching migrating hawks. Park at the upper end of the lot or on the right side. You will more than likely have company, especially on the weekend, and they will gladly share their birding techniques. Of course, you’ll be looking generally into the northern sky, so take an eye shade and suntan lotion. The gnats can be troublesome so some insect repellent is suggested. As the Hawk Lady (Myriam Moore 1912-2006) said, “The passage of Broad-winged Hawks builds up in early September to peak usually between the second and third week of September. More than 1900 hawks have been sighted in a day. More Ospreys pass in September. The Sharp-shinned Hawks passage builds up as broadwings taper off. Migrating Red-tailed Hawks peak in November. There are also sightings of Cooper’s and Red-shouldered Hawks, Northern Harriers, and American Kestrels.” Rarities include Peregrine Falcons, Rough-legged Hawks, Goshawks, Merlins, Sandhill Cranes, American White Pelicans, Anhingas, Townsend’s Solitaires (first state record), Red Crossbills, Cave Swallows, Olive-sided Flycatchers, Orange-crowned Warblers and Mississippi Kites. Bald and Golden Eagles have become more and more common in recent years. Hawkwatching is best in September and October. November is exhilarating. The spring migration in March and April is less spectacular but a good way to pass the days just before the thrilling passerine influx. For more information about Harvey’s, check out http://bijame.googlepages.com/home. DIRECTIONS: Take Rt. 221 south out of Roanoke and go up Bent Mountain. At the top of the mountain take Rt. 612 to the right. This will take you to the top of Poor Mountain. Good birding exists all along this road in spring and early summer. (Rt. 916) and bird the plateau. This area usually supports a number of Chestnut-sided Warblers. Parking and walking the road and side roads to your right can be fruitful, but stay on the road as this area supports a number of rattlesnakes as well. The road curves to the right and starts down the south side of Poor Mountain. There is good birding down this road, but be aware that the road is blocked about half way down and you must retrace your steps. Species frequently nesting along this road include Black-throated Blue, Canada, and Black-throated Green Warblers. At the higher elevation, you may also encounter Veeries, Wild Turkeys and Ruffed Grouse. Poor Mountain is recommended for spring and summer birding primarily. No one goes much in fall, and winter is not recommended. The Bottom Creek area is another attractive birding spot in this neighborhood. Backtrack to Rt. 221 and turn right to Rt. 711. Turn right again to the Bent Mountain Elementary School. HOW TO BIRD IT: There is a large swampy area behind the school with a path to the left and a boardwalk to the right which gets you out into the swamp. This area has been good for Willow Flycatchers as well as Yellow Warblers, Common Yellowthroats, Gray Catbirds, etc. From the school parking lot, turn right on Rt. 711 and then left on Bottom Creek Road (Rt. 607). At first the habitat is basic farmland but eventually you turn right on Bottom Creek Lane (Rt. 637) and enter a beautiful stretch with the creek to your left. There are old camps along the creek as it rushes through rhododendron and laurel thickets. About 2 miles from this area you come to the Nature Conservancy Bottom Creek Gorge site. This road to your right is gated about 100 yards in and signage there indicates that you are welcome to hike into the reserve. The trail leads eventually to a spectacular waterfall as Bottom Creek falls into a deep gorge. I believe good boots and strong legs are helpful here. Backtrack the way you came to Rt. 221. DIRECTIONS: Take I-81 north to exit 150-B to Daleville. About .5 miles past Daleville, take a left on Rt.675 (Glebe Road) and go about another .5 miles to Rt. 1035 (Orchard Lake Drive). Turn right and go about another .5 miles to the pond on your left. GENERAL DESCRIPTION: A 12 acre pond now completely surrounded by residential development, this has been an excellent duck pond with surrounding habitat that attracted in spring and summer: flycatchers, orioles, Yellow Warblers, Eastern Kingbirds, American Woodcocks, Ospreys, both ibis, various egrets, both bitterns, rails and herons and was the site of the last known record of a Bewick’s Wren. It has become less and less productive due to residential development and an extensive carp population which have taken their toll. This has been good in all seasons. It is included here more for its historical and nostalgic value than anything else. However, sometimes when a door closes a window opens and recently a new residential development has opened up near the creek end of the pond. HOW TO BIRD IT: When you reach the pond on your left, continue around the bend in the road, turn right on Fairview Drive and park on the right shoulder. Walk back and check out the pond and surrounding trees and shrubbery. As you return to your car, check the hedgerow to the right along the creek which has been excellent for sparrows in the fall as well as a couple of migrating Connecticut Warblers. Continue on Fairview Drive to the right (Rt. 1046 - a loop road) to the top of the hill and check out the pond on your right (a scope is needed here). As you drive around, check out the surrounding fields and trees – numerous hawks have been seen in this area. DIRECTIONS: In Roanoke City, take the Elm Avenue Exit off of I-581 and head east on Elm (Rt. 24). Go .8 miles to 13th Street and turn right on 13th (watch for signs, “Water Pollution Control Plant”). Go another .8 miles and turn left onto Brownlee Avenue. There are two plant entrances from Brownlee (both are on the left). The facility can be accessed at the second entrance off of Brownlee. This entrance has a secured gate equipped with a call box to obtain access. Upon calling in to the main desk, simply inform them that you are coming in to bird the site. Paved parking is available at the Main Administration building. GENERAL INFORMATION: The facility requires permits (at no cost) for birding the facility. There are two permit options available, either temporary or permanent, available at the main office. Normal access hours are Monday through Friday from 7 AM until 4 PM. (Although the facility is open until 5 PM, you must turn in your admittance badge and vacate the property by 4:00 PM.) Saturday and Sunday outings can be arranged, but you must contact the facility (540-283-8269) at least 48 hours in advance. HOW TO BIRD IT: After parking, you will need to bird on foot. The primary walking areas are packed gravel roads which are relatively flat. Check out the large 33 million gallon concrete basin for ducks (in season), Killdeer and shorebirds. Walk the other dikes to check out the biosolids storage lagoons. Under no circumstances should you walk out on any of the lagoons, even if they appear dry. The material is frequently over 10 feet deep. At the far east end, past the lagoon on the right, there are two patches which can be interesting. To the right takes you up the hill to another pond which, in season, has Great Blue Herons and some ducks (and one time a Least Bittern). Two platforms hae been constructed where visitors are invited to sit and watch the birds. From the main building, walk straight back to the river, turn right to walk on a gravel road next to the river. The STP has been productive in all seasons. Birding is also available on the Roanoke River Greenway and connecting Tinker Creek Greenway behind the facility. DIRECTIONS: Take Rt. 11 (Williamson Road) north of Roanoke just past Hollins University about 1.6 miles north of the intersection of Williamson Road and Peters Creek Road to Rt. 601 (Shadwell Drive) on your right. Turn right and go about .25 miles and you will see the pond on your left. Turn left at the Waterfall Lake sign (don’t bother to look for the waterfall). HOW TO BIRD IT: Park off the road on your left at the top of the first hill. Scan the water and surrounding trees and bushes. This has been an important pond in the history of bird study in Roanoke and Botetourt counties. Despite the heavy residential development around it, it still is host to numerous species of ducks and other waterfowl in season. The area near the shore down the grassy hill from where you are parked has some outdoor furniture and is a “common” area for the home owners. Birders have been made to feel welcome to walk down to the pond side for a better view to the far end of the pond. Just be sure to stay in the common area so as not to trespass on private property. DIRECTIONS: From downtown Roanoke at the corner of Campbell Avenue and Jefferson Street take Jefferson Street south to Walnut Avenue. Turn left on Walnut and proceed up Mill Mountain. At the top there is the proverbial “fork” in the road. Take the left tine and go about 1 mile to the campground on your right. HOW TO BIRD IT: In spring and summer take the RV loop and you will find places to park and trails that wind through the woods at various points. In season this can be a great spot for migrating Swainson’s Thrushes, various warblers, Rose-breasted Grosbeaks, etc. After migration, there are usually nesting American Redstarts, Black-and-white Warblers, etc. If you leave the campground and turn right you will come immediately to an overlook on your left with an exhibit describing several trails. This is fairly productive considering the dry, monotypic habitat. Both the campground and Chestnut Ridge can be interesting in all seasons, although spring and early summer are best. DIRECTIONS: Backtrack to the “fork” in the road and go left into Mill Mountain Park. As one club member remarked, “I think this may be Roanoke’s best kept secret in regard to seeing spring migrants such as Blackburnian, Cerulean, Yellow, Palm and Worm-eating Warblers, thrushes, Rose-breasted Grosbeaks, Scarlet Tanagers, etc. It’s one of those places that really should be birded first thing in the morning.” An Olive-sided Flycatcher was seen here one year. HOW TO BIRD IT: From the parking lot, walk to the observation tower and scan for hawks or bird activity in the trees and bushes below you. From here work the edges to left and right. Downhill to the left has always seemed best and you can bird down along the old road as far as you like. The wildflower garden is also good as is the lower road up to the STAR. HOW TO BIRD IT: Park on the right or left near the “map sign” and covered information box. The map will show the many trails available to you and the locations of major features including hawk watch platforms and pond areas. WRNC is good in all seasons. In spring and early summer it is a migration hot spot, especially in early morning. Also, hummingbird feeders are abundant and well-filled. In fall and winter there are four main feeder stations with lots of feeders which are kept full by center volunteers. Some unusual birds seen here are Sandhill Cranes, Brown-headed Nuthatches, Rufous Hummingbirds, Northern Goshawks, and Philadelphia Vireos. This is also a great place to observe wildflowers and butterflies in the spring. 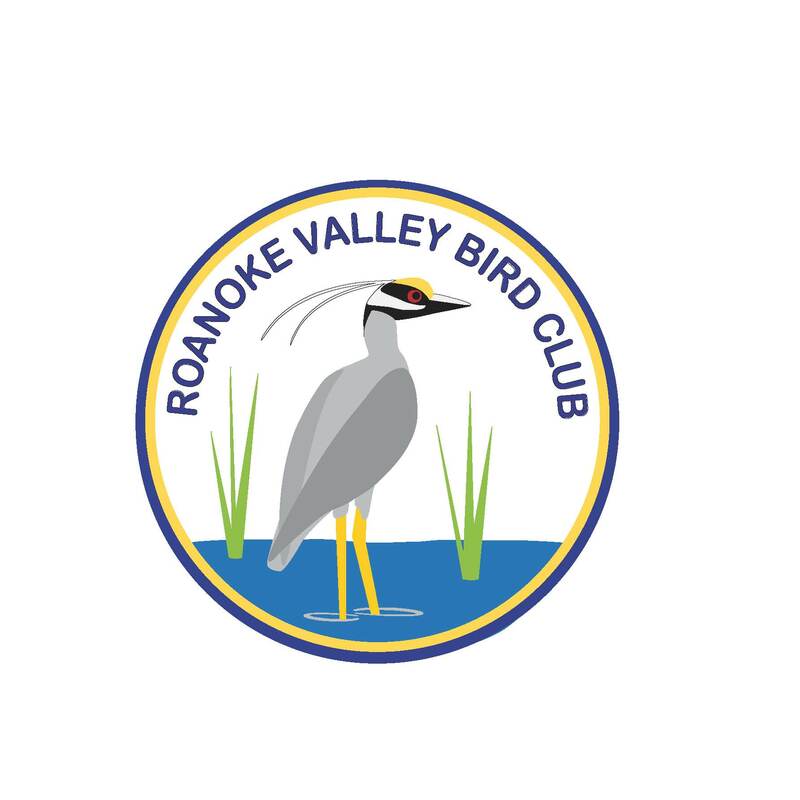 WRNC is affiliated with the Roanoke Valley Bird Club, the Lynchburg Bird Club and the Wildflower Preservation Society. HOW TO BIRD IT: A spotting scope will come in handy here. On the left side of the pond there is a wooden bridge leading to a very well-kept path that follows the edge of the pond all the way to the dam. On the right of the pond, walk the path toward the dam which gives access to a hill from which you can see the entire pond, including a wetland area to the right. This pond has been excellent for ducks and waterfowl in season and the trees lining the input creek are good for orioles and warblers in spring and early summer. Some exciting observations include Red-necked Grebes, Tundra Swans, Snow Geese, American Bitterns, Bald Eagles, Ospreys, Merlins, and numerous sparrow species including Vesper and Lincoln’s. If the water is low and mudflats are exposed, look for shorebirds in spring and fall. Shorebirds seen here include Black-bellied Plovers, Sanderlings, Dunlins, Common Snipes, Greater and Lesser Yellowlegs, Solitary and Spotted Sandpipers and Soras. Also, Rusty Blackbirds are sometimes attracted to the exposed mudflats. Be aware that many area residents walk their dogs here, so you might have some company. DIRECTIONS: From the intersection of Rt. 11 and Rt. 220, go north on Rt. 220 toward Fincastle. Go 10.5 miles through Fincastle to Rt. 679 (Martin’s Lane) and turn right. This is a very productive loop in all seasons with varied rural habitat and featuring a portion of Catawba Creek. HOW TO BIRD IT: Drive slowly and stop at wide spots and pull-offs. There are ponds off to the right and varied farmland on both sides of the road. Scan the sky and the trees around the fields for hawks. At 1.1 miles there is a “fork” in the road where you want to turn left on Poor Farm Road. At 1.4 miles there is a pull-off (actually an old gated entrance to the farm) to the right at a large stand of maturing hardwoods where Red-headed Woodpeckers are often found. In winter this is a great loop for White-crowned, White-throated, and Field Sparrows, etc. The loop ends at Rt. 220, a total of 2.9 miles. Turn left to return to Fincastle. DIRECTIONS: From the junction of Rt. 11 and Rt. 130 in Natural Bridge, take Rt. 130 east 2.5 miles to Rt. 759 (Arnold’s Valley Road). Turn right and proceed 1 mile to Rt. 782 (James River Road). Turn left onto Rt. 782 which becomes Forest Road 3093; a parking area is at the road’s end. GENERAL DESCRIPTION: The exceptionally beautiful Locher Tract, bordered on the north by the James River and by the James River Face National Wilderness on the south, offers river frontage, old fields, pasture fields, hardwood forest, and beaver swamp for uncrowded wildlife viewing. HOW TO BIRD IT: From the parking area, hike along the Balcony Falls Trail in early mornings or late afternoons in spring or summer for a chance to see Carolina Chickadees, White-breasted Nuthatches, Eastern Bluebirds, Blue-gray Gnatcatchers, bitterns and Wild Turkeys. There is also a mowed loop trail through the area. The James River Face Wilderness is 1.6 miles away.